This system is designed to provide protection from unauthorized entry into the vehicle. 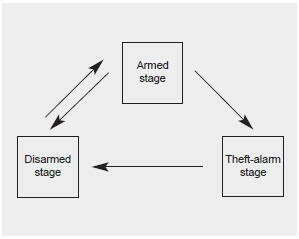 This system is operated in three stages: the first is the "Armed" stage, the second is the "Theft-alarm" stage, and the third is the "Disarmed" stage. If triggered, the system provides an audible alarm with blinking of the hazard warning lights.